After over four and a half hours of public testimony on Monday of this week, The Deschutes County Commissioners Wednesday discussed their options on how to proceed with the current temporary ban on new cannabis-related business in unincorporated Deschutes county. The fact that there was discussion on the details of regulation for an upcoming ordnance rather than an opt-out discussion was good news for business advocates. Although still a possibility, it looks likely that the opt-out is off the table at this time. The discussion began with the grow site, or production facility regulations. Commissioners discussed regulations for grow sites with an emphasis on ways to mitigate issues such as setbacks to neighboring properties, excessive noise and lights at night. One issue that may affect many county residents is whether or not they can operate a grow site on five acres. So far the Commissioners have agreed to a minimum of 10 acres for grow sites in the exclusive farm use zone and multiple use agricultural zone. At this point in the discussion the Commissioners seem willing to allow five acre grow sites only if growing occurs in an enclosed building, not in greenhouses or plastic covered hoop-style greenhouses—a more costly and environmentally unfriendly method of growing and an economic disadvantage to the smaller farmers. The commissioners have yet to lift the current prohibition on non medical businesses in unincorporated Deschutes county. Until that happens the current ban is slated for the November Ballot. Measure 91 passed with 51.86% in Deschutes county, the only county east of the Cascades to pass Measure 91. 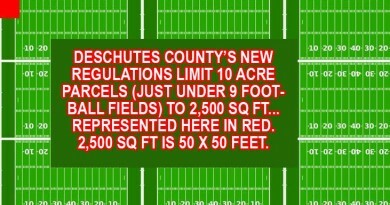 Residents of Deschutes county have been encouraged by the Commissioners to continue to give input via e-mail on the details of pending regulations and whether or not to rescind the current ban. The Commission reconvenes on Monday May 9th to continue the rulemaking process. After over four and a half hours of public testimony on Monday of this week, The Deschutes County Commissioners Wednesday discussed their options on how to proceed with the current temporary ban on new cannabis related business in unincorporated Deschutes County. The fact that there was discussion on the details of regulation for an upcoming ordnance rather than an opt out discussion was good news for business advocates, although still a possibility, it looks likely that the opt out is off the table at this time. One issue that may effect many county residents is whether or not they can operate a grow siteon 5 acres. So far the Commissioners have agreed to a minimum 10 acres for grow sites in the exclusive farm use zone and multiple use agricultural zone. At this point in the discussion the Commissioners seem willing to allow 5-acre grow sites only if growing occurs in an enclosed building, not in greenhouses or plastic covered hoop style greenhouses. A more costly and more environmentally unfriendly method of growing and economic disadvantage to the smaller farmers. The commissioners have yet to lift the current prohibition on non medical businesses in unincorporated Deschutes County, until that happens the current ban is slated for the November Ballot. Measure 91 passed with 51.86% in Deschutes County,the only county east of the Cascades to pass Measure 91. Residents of Deschutes county have been encouraged by the Commissioners themselves to continue to give input via email on the details of pending regulations and whether or not to rescind the current ban. The Commission reconvenes on Monday May 9th to continue the rule making process.